The white smoke has risen! Habemus papam! The fix vote is in! The College of Cattinals have reached a verdict. Check out all this bling! Wonder if it's real … Betta not take it into da hood. All Hail Pope Keisha I. My first order of business is to move the Catican to New Jersey. If I'm Pope, I can live wherever I want. My next order of business is to change that stupid rule that the Pope can't have pets. Here's a little video of how a Pope is chosen for those non-Catolics. I, being a stunning ghetto cat, bypassed all those steps in my ascension to Popehood. Thanks to Mr. Breeze (@Kittehboi) for Tweeting this video to me. Well, I *was* kind of interested in the position myself, but on second thought, Pope CK I has a nice ring to it. It just seems.....right, you know? Go for it. I'll be waiting for tomorrow's balloting! The pope hat suits you I think. I didn't know the pope wasn't allowed to have pets... what a silly rule.. I think there are a lot of silly rules when it comes to pope stuff. I prefer to worship Bast, the cat god, or failing that, myself. So I guess that means I am disqualified to be pope. If this is a voting thing, you got mine!!! *swoon* you look lovely in your cap! Ha ha Keisha you look real fine in all your Pope gear. We can't wait to hear more about what's happening in the Catican. LOL! Have a wonderful Wednesday. We think that Pope Keisha I will get the Catican whipped into shape in short order! Oh now you can go around chanting "Domini domini domini" and whacking people over the head with the "Patented Pope Stick" you're holding .... MOL! You don't think JP II or Benny-16 used it just to lean on, do you? MOL MOL! A Pope from da hood is a grand idea CK! what kind of white smoke are you puffing anyway??? Pope Keisha it is! VIVA! I mean, EXCELSIOR! Yes! Now we can visit the Catican! All Hail Pope Keisha! I don't know CK ... there's a Pope contest going on over at Mollie's place...you may have some competition there ...not saying you wouldn't make a great Pope...can I go fur a ride in the Popemobile? Ha! This is hilarious and so are the comments! What??? Popes can't have pets?? Who said? That is the silliest thing we've heard all day! Go you, Pope Keisha! Wow what a dumb rule about the POPE not being allowed to have pets. That ranks right up there with not allowing the humans to use bc. We concur you will be a much better Pope and we know you will put the humans on the right path. They seemed to have strayed a lot under the leadership of your predecessors. All Hail Pope Keisha I! How come the Pope cannot have a pet? The new guy chose to be Pope Francis, wasn't Saint Francis the patron saint of animals? So he should have one! Silly rules. What will you change your name to CK? I think we'll just hang out here, smoke nip...create green smoke and make fun of each other. We'll kiss your ring if you soak it in tuna juice. CJ if me was a Cardinal (not the bird) me would has voted for yous! 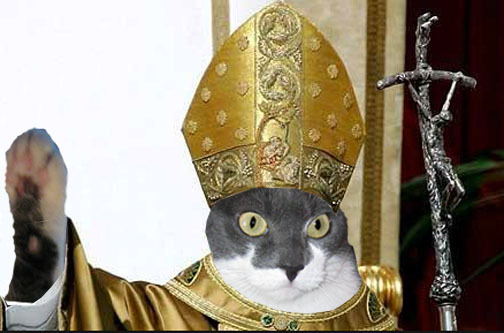 Hilarious and pawsome, you make a great Pope. Signs are bad, CK. Perhaps there's a role for us in the Curia. Being pope is too much work, and you always have to be good because everykitty is looking up to you...we'll let you have the job! MOL. Keisha - You look amazing in gold robes. How about free Tuna for every kitty every day! Holy CAT! They didn't choose YOU?!? We agree with the Spitster, we wuz robbed.